Tenaris SA (BIT:TEN) (NYSE:TS) is a Luxembourg-based holding company active in the supply of tubes and related services mainly for the energy industry and certain other industrial applications. The customers of the Company include oil and gas and engineering companies engaged in constructing oil and gas gathering, transportation and processing facilities. The products of the Company include casing, tubing, line pipe, and mechanical and structural pipes. The Company has three business segments: Tubes, Projects, and Other. The Tubes segment includes the operations for the production and sale of both seamless and welded steel tubular products and related services. The Projects segment includes the operations for the production and sale of welded steel pipe products used for pipeline projects. The Other segment includes the operations for the production and sale of sucker rods, welded steel pipes for electric conduits, industrial equipment and raw materials. 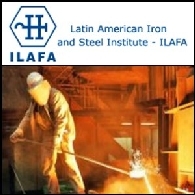 El Instituto Latinoamericano del Fierro y del Acero (ILAFA) se complace en invitarle al 51 Congreso Latinoamericano de la Siderurgia 2010, que tendrá lugar del 24 al 26 de octubre del presente año en el Hotel Hilton Buenos Aires de 9:00 am a 4:00 pm, además de interesantes visitas guiadas a la ciudad y un hermoso desayuno en el Restaurante La Colección, mismo que se especializa en comida mediterránea. Después del evento, usted puede disfrutar de la ciudad de Buenos Aires con las visitas turísticas guiadas a los principales puntos de interés, el Museo Fortabat, el Teatro Colón y a la Fundación PROA.